The release of online payments, sharing of bills via email, text message, text-to-voice, and fax, updated invoice layout plus more. The ability to link your Stripe and Square account to Kalix. Learn More. The easy sharing of bills via email, text message, text-to-voice, and fax. The ability for clients to pay invoices online. The capacity to preview bills before downloading or sharing. Updated invoice and superbill layout. Improvements to the sharing of bills via the automated bill reminders and late payment notices. The redesign of the bill template pages. 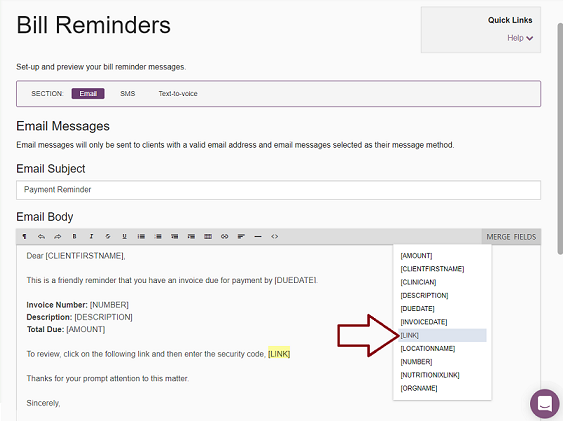 If you use Kalix's Billing & Late Payment Reminders functionality (or you are thinking about starting), you need to update your message templates to continue their use. 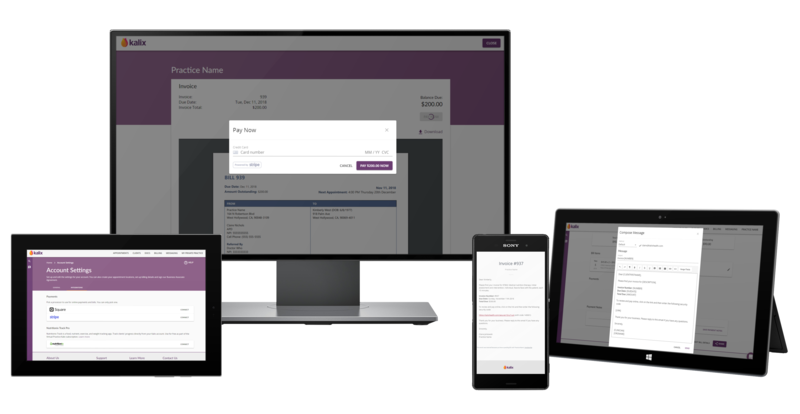 To support online payments, we were required to change the way invoices are shared. Kalix now shares invoices using a secure link and code. Please edit your billing & late payment reminders message templates to add the [LINK] merge field. The screenshot below demonstrates how to do this. The ability to edit the saved payment information on bills. New bill export - Bill Items (a useful spreadsheet export when bills containing multiple bill items. Each bill item is listed as a new row). Documents and online forms: the clinician conducting a particular client appointment can edit linked documents and linked online forms, even if other users created them. Appointment calendar: appointment slots no longer display the appointment location name, in accounts with a single location. New document merge field: [[Clinician.Qualifications]] for clinician credentials/qualifications is now available. Contacts: the addition of new profession types to contacts: Diabetes Educator, Dietitian/Nutritionist, Exercise Therapist, Occupational Therapist, Physical Therapist, Therapist, Speech Language Therapist, Social Worker, and Psychiatrist. If you are wondering what's coming next for Kalix, below is an outline of future updates. Support for iPad, iPhone and Safari browser. Improve support for slower internet connections. The functionality to mute participants. Following the telehealth update, there will be a series of three new releases (consisting of online payments phase 2 to 4) to finish the integrated online payments feature. The ability to charge credit cards directly from the payments page of bills (for in-person payments). The invoicing for and collection of partial payments and co-payments. The capacity to upload files, e.g. EOBs on the payments page of bills. The capacity to save credit card details to client files for future payments. The redesign of the client file. The ability for directors to hide Kalix's billing feature from selected users. The collection of credit card details and upfront payments (full or partial) via the online scheduler. The redesign of Kalix's scheduling widget.